United Nations Secretary-General Ban Ki-moon arrived in Beirut on Thursday on a two-day visit to Lebanon that is expected to focus on Syrian refugees, the National News Agency (NNA) reported. He was welcomed at Rafik Hariri International Airport by director-general of the Foreign Ministry Wafiq Rahimi and U.N. Special Coordinator for Lebanon Sigrid Kaag . 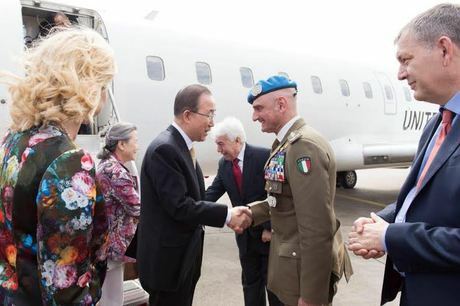 The U.N. chief first headed to the southern coastal border town of Naqoura where he was received by UNIFIL Head of Mission and Force Commander Major General Luciano Portolano, announced the international force in a statement. Speaking during his visit to the headquarters of UNIFIL the secretary general noted that southern Lebanon has seen one of the quietest periods in nearly four decades since the adoption of the U.N. Security Council resolution 1701 in 2006. 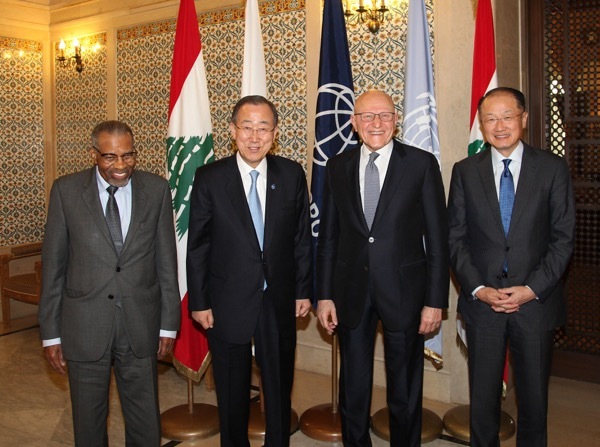 “Prevalence of a stable security environment in south Lebanon, continued commitment of the parties to the cessation of hostilities, increasing ability of the Lebanese Armed Forces to ensure security of the country – these are the key elements for the successful implementation of the [UNIFIL] mandate,” said Ban. He called for making an effective and meaningful use of the world body’s peacekeeping mission in Lebanon in preventing hostilities and de-escalate tension in the southern part of the country. He underlined the need for a strong cooperation between the Lebanese Armed Forces and UNIFIL in south Lebanon, including through the Strategic Dialogue process, and efforts that are underway to ensure the implementation of the resolution 1701. “The Strategic Dialogue remains crucial if the Lebanese army are to take on greater responsibilities in UNIFIL’s area of operations,” he said, calling for an increased international assistance in support of the military in order for them to fulfill their vital responsibilities throughout the country, as recently emphasized by the Security Council. Ban then returned to Beirut where he held talks with Speaker Nabih Berri. The speaker told reporters after the meeting that discussions addressed the Syrian refugee file and ways to end Lebanon’s presidential vacuum. Ban then headed to the Grand Serail for talks with Prime Minister Tammam Salam. Ban praised Lebanon’s army on its ongoing fight against terrorism, while urging political powers to end the presidential vacuum. “Lebanon is a symbol of diversity in the region and the presidential vacuum should be resolved as soon as possible,” he added on the first day of his two-day trip to Lebanon. “Few countries have shown such generosity towards Syrian refugees,” he noted. Ban also expressed his “deepest condolences” to Lebanon over the death of a soldier in a roadside bomb in the northeastern border area of Arsal earlier on Thursday. Salam also highlighted the burden of Syrian refugees on Lebanon, saying that the country is no longer able to support further burdens. The meeting between Salam and Ban was also attended by World Bank chief Jim Yong Kim and Islamic Development Bank President Ahmed Mohamed Ali Al-Madani. The head of the World Bank urged during a joint press conference with Salam, Ban, and Madani Lebanese officials to reactivate the political institutions, most notably parliament, in order for Lebanon to benefit from financial grants pledged to the country. He revealed that the World Bank had presented 100 million dollars to Lebanon’s education sector in recognition of its education of refugees. Agreements worth around 400 million dollars were also signed during Salam’s meetings with the officials. Lebanon currently hosts around 1.5 million Syrian refugees who have escaped the fighting in the neighboring country. Salam earlier ruled out any naturalization for Syrian refugees during an interview with An Nahar newspaper , saying he would reiterate to the U.N. chief Lebanon’s official stance on its rejection of such a process. The visit of the U.N. secretary-general comes a few days after EU foreign policy chief Federica Mogherini’s trip to Lebanon. Lebanon has been without a president for almost two years amid a long-running political deadlock. Around 4.6 million Syrians have fled to nearby states — Jordan, Lebanon, Turkey, Iraq and Egypt — while hundreds of thousands have gone to Europe. Last February, world leaders pledged a total of $10 billion to help millions of victims of Syria’s civil war and the countries hosting them. “He revealed that the World Bank had presented 100 million dollars to Lebanon’s education sector in recognition of its education of refugees.” …. NOTHING to the Lebanese. No Education for their kids. NO VISIT to Tripoli – ‘The North’ which had 18 battles in a city and where people starve in the cold and dark. NOTHING beyond Beirut. I am SURE the Syrians don’t want THAT kind of ‘Naturalization’. “Agreements worth around 400 million dollars were also signed during Salam’s meetings with the officials.” … 400 being the number of families which control Lebanon. Nice round number.